Yay! 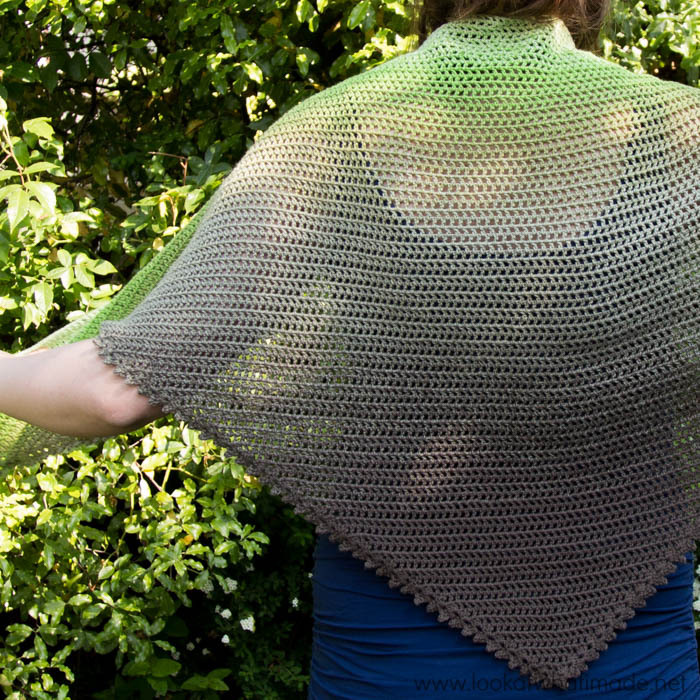 It’s Friday and I can finally share the pattern for the My Story Shawl with you. This last week has been full of stories for the Lookatwhatimade family and I am still debating which ones I can share with you. So, while I keep myself busy with pondering, you are welcome to start making this shawl.. The pattern is very simple (but not boring). Think of it as a blank canvas to tell your story on! Using a long colour-change yarn like Whirl (761) creates a gentle graduation of colour, with each colour stretching over multiple rows. The colour stripes at the bottom of the shawl will be wider than the stripes at the top. If you haven’t heard of Whirl yet, you can read more HERE. It is gorgeous to work with and at 1000 meters per 200g ball, it makes for a substantial yet light shawl. One of my friends asked me how I choose which end of a slow colour-change ball to start with, so I thought I would touch on it here. When choosing which end of the ball to start working from, ask yourself this question: “Of the two colours, which one would I rather have framing my face, and which one will showcase my derrière to maximum advantage?” As a general rule, I prefer darker colours at the bottom and lighter colours at the top. I would be interested to know how you go about deciding. 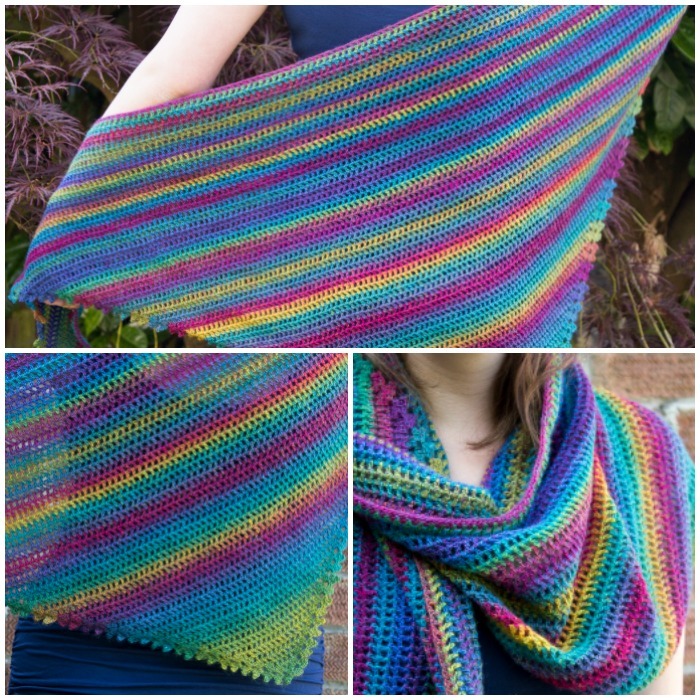 Using a shorter colour-change yarn like Invicta Colour (958 x 2) will yield more stripes, with colours at the bottom of the shawl stretching over a few rows and colours at the top of the shawl lasting less than a row each. Invicta Colour is one of those yarns that I keep returning to. You can have a look at my Railway Mandalas and the Namaqualand Shawl if you would like to see more examples of how it works up. 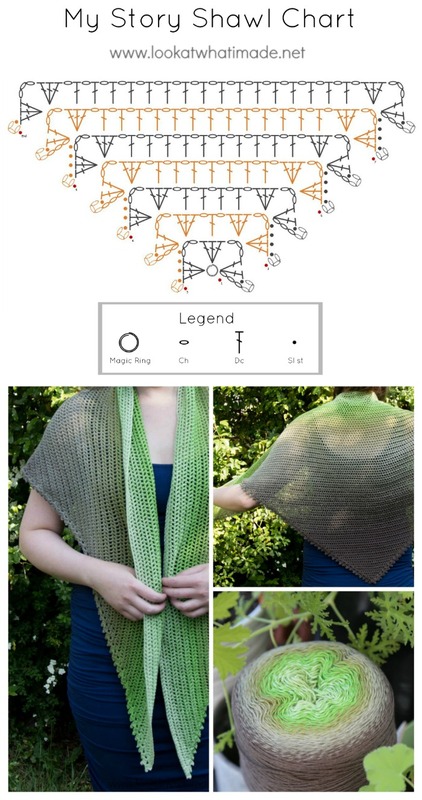 If you are interested in the reasoning behind the name of the shawl, you can find out more HERE in my Reveal post from last week. © Dedri Uys 2017. All Rights Reserved. Copyright protected by Scheepjes. Scheepjes Whirl Pistachi Oh So Nice (761) – 4 ply/220 g/1000 meters (60% cotton/40% acrylic) – available from WoolWarehouse and Deramores (Internationally), as well as other Scheepjes retailers. () – Repeat instructions between parentheses the number of times specified. Also used to indicate stitches to be worked into the same stitch/space. Following the pattern: 15 dc + 14 ch-1 spaces (width) and 13 rows (height) per 10 cm (4”) square – unblocked. Gauge is not massively important with this pattern. 192 cm wide by 64 cm high (75” x 25”) – unblocked. If you need help with the magic ring, please see THIS TUTORIAL. I still advise you to work your yarn ends away VERY thoroughly when using the magic ring. 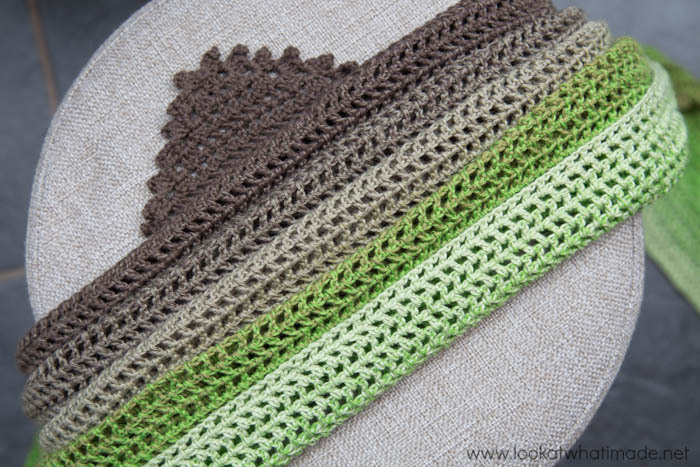 The picot edge of this shawl is created as you go. Your work will be asymmetric at the end of every row. 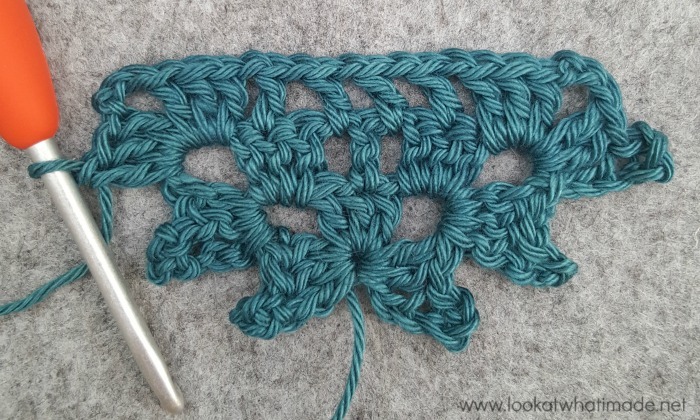 Each row will have a picot at the start, but not at the end. This will be fixed at the start of each subsequent row. Repeat Row 3. Each repeat will have 3 more dc and 3 more ch-1 spaces than the previous repeat. 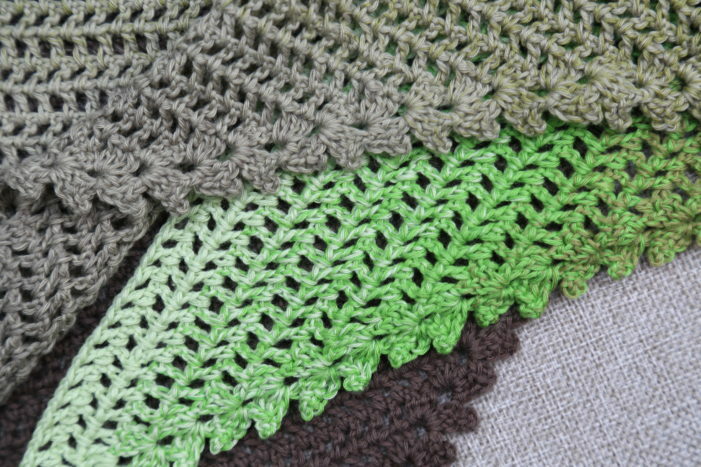 For the example shawl, Jenny ended up making 86 rows in total. Depending on your tension, you might have to make more or fewer rows. 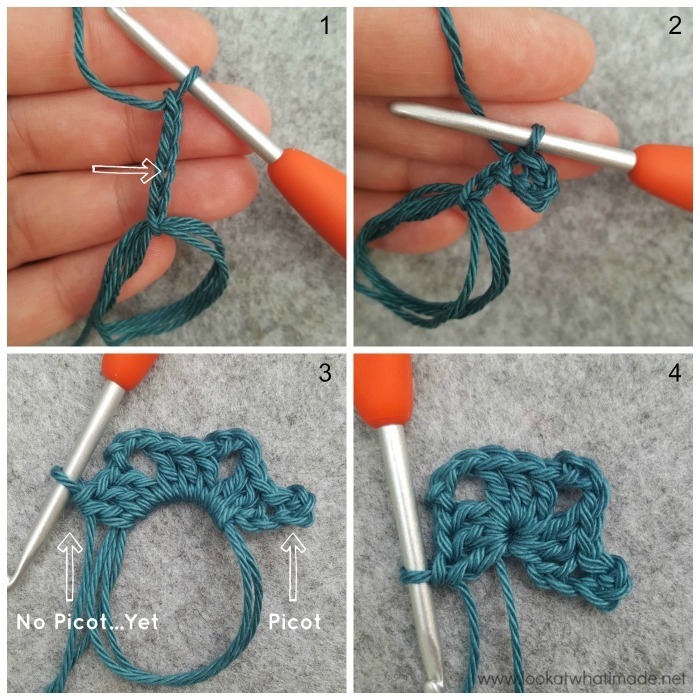 Just keep repeating Row 3 until you don’t have enough yarn to make another repeat, or until your shawl is as large as you want it to be, then finish off as instructed below. 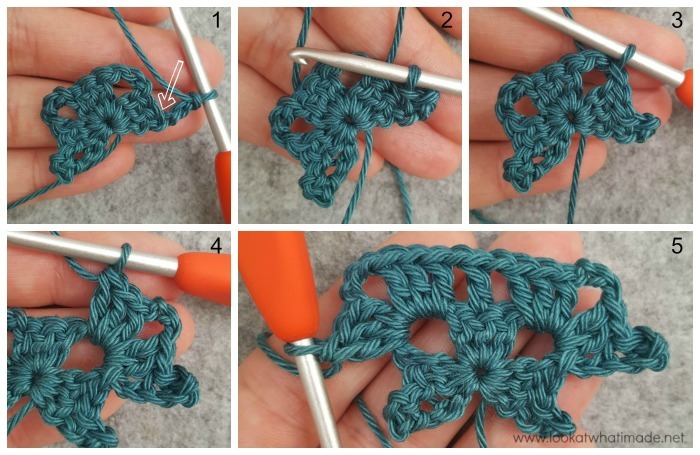 When you have made your last row, ch 3 and sl st in the dc at the base of the ch-3 to form a picot, remembering to turn before you do so. Fasten off and work away your ends. This shawl does not need to be blocked, but you are welcome to do so if you want to. For blocking, I usually use these Interlocking Foam Exercise Mats. 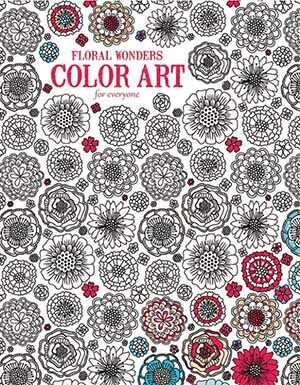 They are similar to these Knitter’s Pride Lace Blocking Mats , but they are slightly cheaper and I prefer blocking on an all-black background (it’s just prettier than multiple colours). I also use these Clover Fork Blocking Pins , although regular rust-proof pins will work just as well. If you are going to make this shawl, please share your photos using #mystoryshawl so that Jenny and I can Oooh and Aaah! 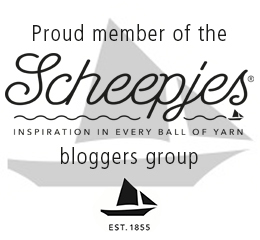 Scheepjes Whirl and Invicta Colour are both available from WoolWarehouse and Deramores (Internationally), as well as other Scheepjes retailers. Want to see more of our ‘My Story’ journey? Would this shawl be suitable to wrap the ends around the waist and tie in back? I was looking for something ‘different’ yet not overly challenging, this is working up nicely. thank you. Mindless work during the crazy holiday season but it creates something beautiful! I just found your pattern today and decided to try. Really like. I have another shawl started with another pattern, will probably rip it out and start again this pattern. My yarn is heavier and the hook is a 4.00mm. It is coming out fine for me. Thanks for the pattern. Hi :) I’m glad you like it. It’s a nice, calm pattern once you get used to the start/end of each round.